There have been a lot of changes to the Mariners lineups over the past year and most of those changes involve an entire roster of former or current Tacoma Rainier players. Last year we had the opportunity to see a total of 18 players make their MLB debut in guys like; Dustin Ackley, Kyle Seager, Trayvon Robinson and Blake Beavan. This year we have already had the opportunity to see guys like Erasmo Ramirez and Munenori Kawasaki make their MLB debut, but one player in particular that is always on my radar is Carlos Peguero. Peguero started the season with the club in Japan and then came back for a few more Spring Training games in Peoria, AZ. After taking a day off to fight a flu bug, Peguero was back in the action. Before the season got underway again here in the U.S., Carlos was informed that he would continue his season this year with AAA Tacoma. I was pretty bummed to hear the news, but I can be sure that it won't be for long. 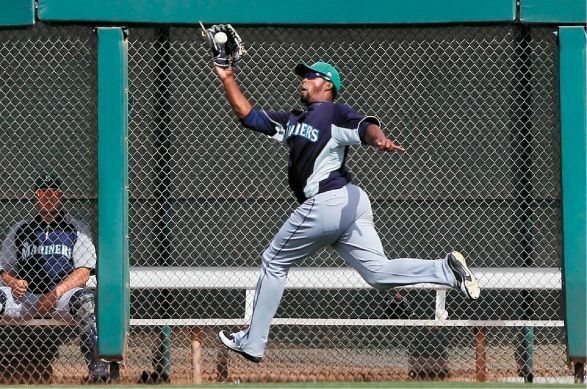 Since being down in Tacoma, Peguero spent weeks on the DL after having surgery on the medial meniscus in his knee. At the beginning of his stint in Tacoma, Peguero was absolutely on fire and since coming back from the injury he has simmered a bit, but relatively still doing good. I understand why he was sent down, there are some things that Peguero needs to work on. One of those things is his strikeout to walk ratio. He is a power hitter, and most power hitters tend to strike out a bit more than others. In the past 10 games he has struck out a total of 14 times. That's quite a bit, especially when you add to the fact that he has consistently struck out at least once in 9 straight games. He has only drawn 4 walks in that same time period. On the other hand, he also has a total of 15 RBI and 5 homers in his last 10 games. I think I could handle that trade off. Another thing to take note of is his average versus left handed pitchers. Peguero is hitting .353 against lefties this year while dropping down to .273 when facing a right handed pitcher. That's a huge difference. He's working on being more patient at the plate and taking more pitches, laying off bad pitches. Currently he is hitting .303 with a .385 OBP and a .674 SLG. His 9 homers match Justin Smoak, but Peguero was also off for a large portion of the season. I always have to remind myself the difference between AAA pitching and MLB pitching and that these numbers don't always transpire the way we think that they should when a player is called up, but Carlos Peguero is the kind of bat that the M's are missing in their order. We have nobody with absolute raw power like he has. Adding him into a lineup with Smoak, Jesus Montero and Kyle Seager would be amazing. The only thing I struggle with is who to take out of the lineup. With all our players having such great stories I have fallen in love with many of them, but when the rubber meets the road, I want to win games, I want to see homeruns and I want to see Peguero. It's hard to have guys like John Jaso out of the running, Miguel Olivo and Brendan Ryan. These guys are all great guys and have a great attitude, but just wouldn't make the starting roster for me. I really like Casper Wells who recently got demoted too, but he will get his own blog post soon. 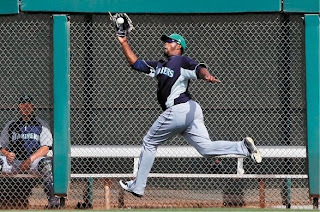 Carlos Peguero has the ability to be the answer to some of the M's biggest problems. It's my hope that he comes into his own in AAA and is able to come back to the MLB roster and prove that he can hang. I'm rooting for him, and I'm sure a whole host of other people are too. Here's to you Carlos! Hope we see you again soon!